• Designed To Separate and Remove Debris From Aquarium Gravel. • Stretch From 9 To 17. Attaches To Faucet Along With Gravel Vac Kit. • Wide Mouth Nozzle For Faster Cleaning and For Hard To Reach Areas. • No More Carrying Pails Of Water To and From Your Tank. • Clean, Drain and Fill Kit With 50 Foot Hose. • Removes Harmful Waste From Gravel, Whiteile Performing Routine Monthly Water Changes. • Helps Change Water In Aquariums. • Removes Harmful Debris From Gravel. 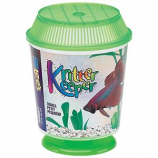 • Designed To Separate and Remove Debris From The Aquarium During Routine Water Changes. • Ideal For Use In Tanks With Up To A 20 Gallon Capacity. Ideal home for betta splendens siamese fighting fish.. Features a snap tight lid and matching pedestal stand. . . .
Nest Multiple Units To Create Displays, No Complicated Filtration System Is Required For This Low-Maintenance Tank. 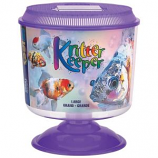 They May Be Used As A Space-Saving Aquarium Or Insect Haven, But Are Also Ideal For Use As A Small Animal Keeper. Round shape with lid and pedestal holds 1.5 gal. Features snap tight lid with airline access hole and matching pedestal stand.. Lid has hinged viewer/feeder window and attachment hole. Easy to clean using warm water and soft cloth. Made in the usa. • Resistant To Ultra-Violet Rays. • Features Slip Fit For Standard Barbed Fittings Commonly Used In Pond Applications. • Blends Easily With Pond Liners. • Size and Flow Arrows Printed On All Tubing. • Marked Every Foot For Easy Measuring. Flexible Airline Tubing 25 X 6.35 M.
• All Reptile Ranches Have Hinged Viewer/Feeders, Attachment Holes and Airline Tubing Holes. • May Also Be Used For A Space-Saving Aquarium Or Insect Haven, But Are Also Ideal For Terrariums Or Nurseries. The Close Proximity Of The Bettas Stimulates Them To Intensify Their Colors, Spread Their Fins and Flare Their Gills. Use As A Holding Tank, Treatment Tank, Or For Observation Of Prospective Purchases, Or Suspected Sick Or Pregnant Fish. • Attach The Ultra Gravel Vac Directly To Most Faucets Using The Faucet Adapter Provider. • Drain The Dirty Water Right Into The Sink and Refill The Aquarium With Ease. • Twenty-Five Percent Water Changes Should Be Performed Once A Month. Use To Split One Airline Outlet Into Two.